Sorry I've been so MIA, but alas... being a working mom is almost impossible! Anywho... though I am naming this about a specific Tintin book, I'm really just writing in because I haven't yet given my boy Tintin some quality lovin' on this site. About two years ago, Tintin opened up a cartoon/graphic novel obsession for my son that is still going strong today. It started with Tintin and has expanded into Babymouse, Zita the Space Girl, Amulet, Ghostopolis, Bone, Lunch Lady and on and on. 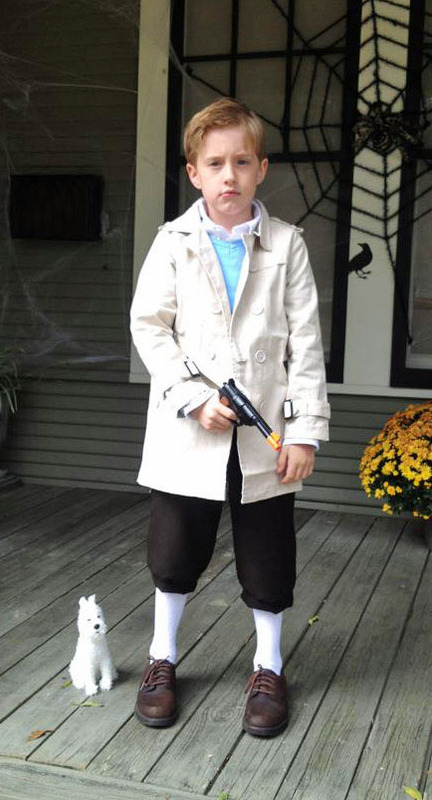 Around this time last year, the boy decided he was going to be Tintin for Halloween and he stayed true to his word. (See picture to the right.) Though finding vintage Tintin books can be near impossible, it is not totally hopeless. Like when my thrifty BFF zoinked a US hardcover first edition of Destination Moon, a moment in time that I will secretly resent her for until the day my corpse in rotting in the soil. But that's neither here nor there. 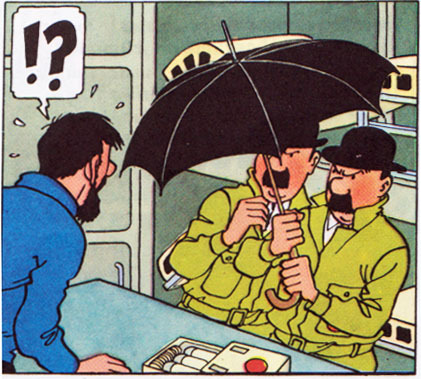 The point is, Tintin is awesome. I am going to openly plagiarize from the Wiki to get those not in the know up to speed. "The Adventures of Tintin is a series of comic albums created by Belgian artist Georges Remi (1907–1983), who wrote under the pen name of Hergé. 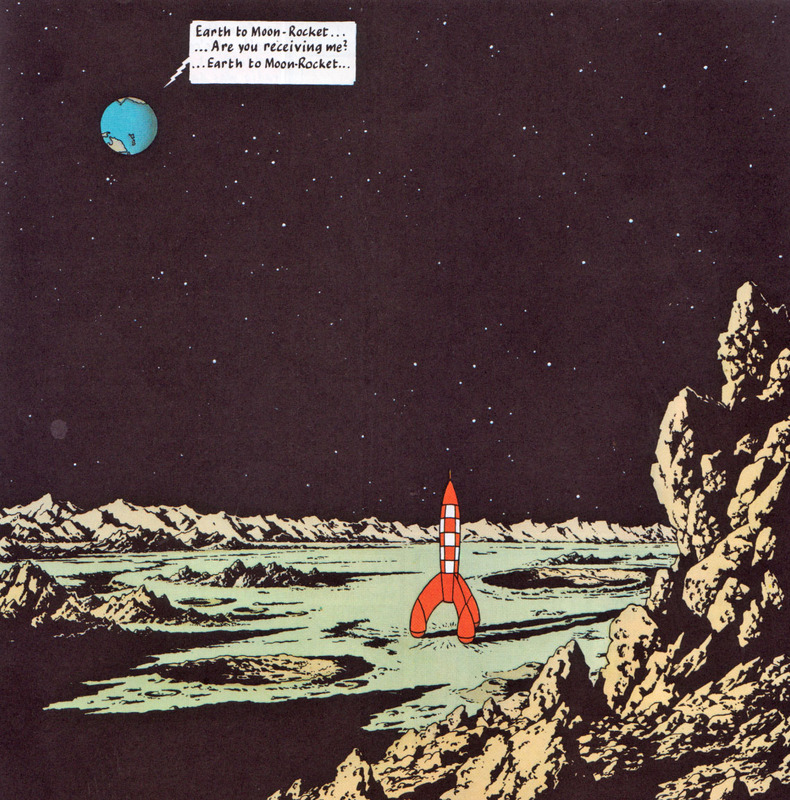 The series is one of the most popular European comics of the 20th century, with translations published in more than 50 languages and more than 200 million copies of the books sold to date. The series first appeared in French in Le Petit Vingtième, a children's supplement to the Belgian newspaper Le XXe Siècle on 10 January 1929. The success of the series saw the serialized strips published in Belgium's leading newspaper Le Soir and spun into a successful Tintin magazine. Then in 1950, Hergé created Studios Hergé, which produced the canon series of twenty-four albums. The Adventures of Tintin have been adapted for radio, television, theatre, and film." "The series is set during a largely realistic 20th century. 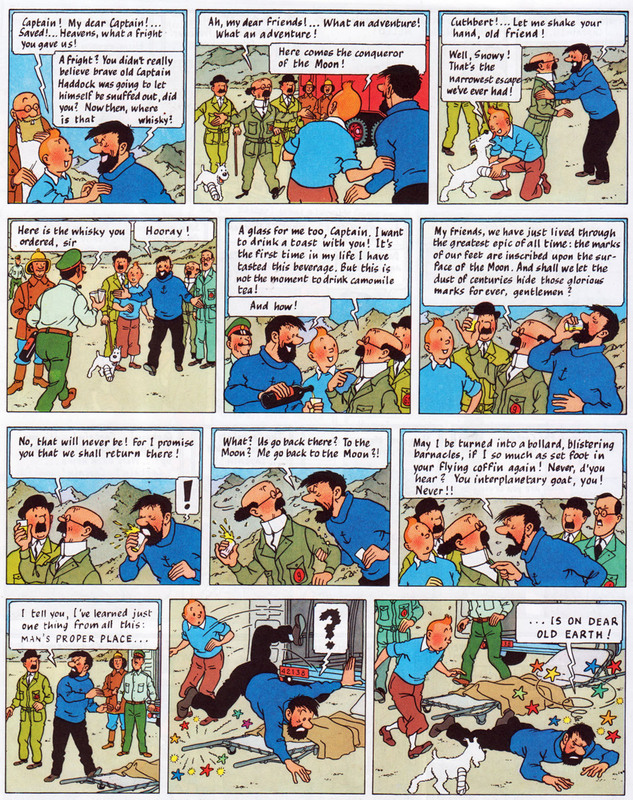 Its hero is Tintin, a young Belgian reporter. He is aided in his adventures by his faithful fox terrier dog Snowy (Milou in the original French edition). Later, popular additions to the cast included the brash and cynical Captain Haddock, the highly intelligent but hearing-impaired Professor Calculus and other supporting characters such as the incompetent detectives Thomson and Thompson. 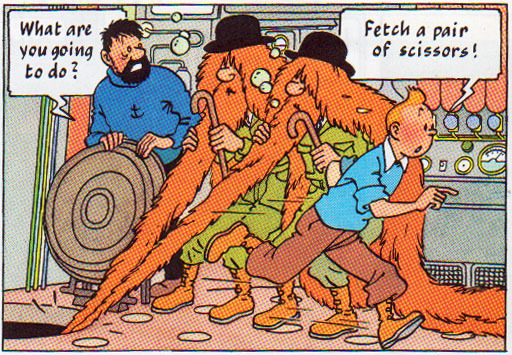 Hergé himself features in several of the comics as a background character, as do his assistants in some instances." Unlike my thrift BFF (who was a big fan since childhood and probably way more deserving of the previously mentioned library sale purchase), I was only vaguely aware of the Tintin books growing up. I used to look at them sometimes in the library at school, but their intrigue and espionage-filled story lines always felt a wee bit over my head. Not so for my son, who became entranced from the moment he picked up the first book. It came at the perfect time to absorb some of his little boy obsession with guns and hand-to-hand combat. 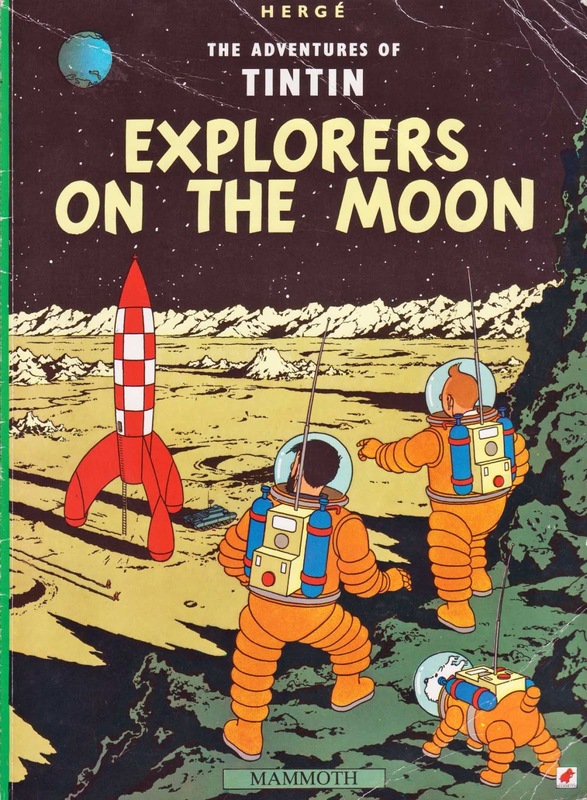 Explorers on the Moon is the seventeenth book in the Tintin series and a sequel of sorts to the aforementioned Destination Moon, and has a plot not dissimilar to the film Apollo 13, which the boy loved BTW. It's good to begin the series from the beginning at The Land of the Soviets, but do bear in mid, some of the ideas in the earlier books are a bit dated and often racist so an open dialogue with your child is required. The intrepid reporter Tintin and his dog Snowy have become a huge part of the collective imagination in our family. Though I've come to love all the comics and graphic stories in my son's bigger boy library, I am glad it was the granddaddy of them all that started him off. We are a house full of Tintin fans! That is the book that helped us turn the corner for my son and his ability to read. He was so desperate to know more of what was happening in the pictures that he taught himself! Do you know about Asterix and Oblix? Also, Lucky Lukes are recently reprinted. Your adorable little guy will love those as well!